by Tyler O'Neil: Roughly 200 women have testified to Judge Brett Kavanaugh's history of treating women "with decency and respect," going back 35 years. This testimony seems particularly important, given the suspiciously timed accusation of sexual assault coming from 51-year-old accuser Christine Blasey Ford. On Friday, 65 women who knew Kavanaugh in high school joined at least 131 other women who testified to his character over the years. "We are women who have known Brett Kavanaugh for more than 35 years and knew him while he attended high school between 1979 and 1983," the women wrote in a letter to Senate Judiciary Committee members Chuck Grassley (R-Iowa) and Dianne Feinstein (D-Calif.). "For the entire time we have known Brett Kavanaugh, he has behaved honorably and treated women with respect. We strongly believe it is important to convey this information to the Committee at this time," the women added, directly addressing Feinstein. Last Thursday, Feinstein announced she had referred a letter accusing Kavanaugh of sexual assault to "federal authorities." Later that day, the FBI announced it would not open an investigation. On Sunday, the accuser, Christine Blasey Ford, came forward with her allegations in an interview with The Washington Post. Ford said Kavanaugh and his friend, Mark Judge, were "stumbling drunk" when they got her in a room. According to her account, Kavanaugh "held her down with the weight of his body and fumbled with her clothes, seemingly hindered by his intoxication." The accuser said the now-Supreme Court nominee "groped her over her clothes, grinding his body against hers and clumsily attempting to pull off her one-piece bathing suit and the clothing she wore over it." "I thought he might inadvertently kill me," Ford added. Ford did not express her account until she spoke with a therapist in 2012. She sent the letter to Feinstein in July, and Feinstein did not reveal the letter until the 11th hour. In a statement provided by the White House, Kavanaugh denied the allegation. "I categorically and unequivocally deny this allegation. I did not do this back in high school or at any time," he said. Mark Judge called Ford "absolutely nuts." Even if Ford's account is true — and not politically motivated, as she insisted — it does not fit with the testimony of about 200 other women. "Through the more than 35 years we have known him, he has always treated women with decency and respect," the 65 women who knew Kavanaugh in high school wrote to the committee. "That was true when he was in high school, and it has remained true to this day." When these women sent their letter on Friday, they joined a chorus of voices praising the Supreme Court nominee. Ten women who attended Yale University with Kavanaugh sent their own letter to the committee in August. "Before he was a lawyer and a judge, Brett was an excellent student, a dedicated basketball player, and a great friend," the women wrote. "He earned top grades, but was always humble; he never showed off his obvious brilliance or acted arrogantly. He was kind, accessible, and had a quick sense of humor. Brett was and remains a loyal friend to us and to many of our classmates." The women added, "Brett treated us as friends and equals in all respects. Many of us played varsity sports at Yale. His appreciation of the importance of women’s athletics was impressive at that time. It clearly is something he has carried forward to the present day, with his years of coaching girls’ basketball teams and his raising two daughters who are enthusiastic athletes and sports fans." The women recalled seeing Kavanaugh at reunions, noting that "audience members of diverse viewpoints have been impressed with Brett's graciousness, thoughtfulness, and insights. That is simply the Brett we have known since college," they wrote. "He is immensely generous, intelligent, and warm." Eighty-four women who knew Kavanaugh in the George W. Bush White House also joined their voices to this chorus in August. "The West Wing is a small place. The hours are long, and the pressure is intense. You get to know your colleagues well in those conditions," the women wrote to the Senate Judiciary Committee. "And in Brett Kavanaugh, we got to know a brilliant lawyer, a thoughtful friend, and a man of the highest integrity." They also praised his treatment of women. "As former colleagues of Brett’s, we know his commitment to equal treatment of women in the workplace and are especially proud of his efforts to encourage and support women lawyers. More than half of Brett's law clerks have been women, and he has worked tirelessly to support them in their legal careers," the women added. Eighteen women who formerly served as law clerks to Judge Brett Kavanaugh also praised his treatment of women. "We feel compelled to write separately to convey our uniformly positive experiences with the Judge as a boss on issues of gender and equality in the workplace," the 18 former law clerks wrote to the Senate Judiciary Committee. The women wrote that "women in the workplace still face challenges, inequality, and even harassment." Kavanaugh had done "important work ... to remedy those disparities," they insisted. "In our view, the Judge has been one of the strongest advocates in the federal judiciary for women lawyers." "Judge Kavanaugh has hired 25 women and 23 men as law clerks, achieving rare gender parity," they testified. That included "one year in which the Judge hired four women law clerks — something we understand had never previously been done at the U.S. Court of Appeals for the D.C. Circuit. And he has sent 21 of those 25 women clerks — an impressive 84 percent — on to clerkships at the Supreme Court." This judge did not only make history, however. He also proved "a dedicated mentor to all of his clerks, men and women alike. He has counseled us on our career options, provided honest and highly valued recommendations to prospective employers, and sometimes given a much-needed nudge to those of us who doubted whether we were qualified to chase our ambitions." "It is not an exaggeration to say that we would not be the professors, prosecutors, public officials, and appellate advocates we are today without his enthusiastic encouragement and unwavering support," the women wrote. Kavanaugh's former Harvard Law students also praised him. The list included at least 17 women and likely more (identified by female first names by PJ Media). "We may have differing views on political issues surrounding the confirmation process, but we all agree on one thing: Judge Kavanaugh is a rigorous thinker, a devoted teacher, and a gracious person," the former students wrote to the Senate Judiciary Committee. They called the judge "a valued mentor," saying he "was exceptionally generous with his time" and "continued to provide advice and support long after the class ended." Kavanaugh has also proven "generous with his time" in coaching girls' basketball. Julie O'Brien, a woman from Chevy Chase, Md., whose daughter has been coached by the judge, also wrote a letter to the Senate Judiciary Committee — and an op-ed in The Washington Post. "I have had the pleasure of knowing Brett Kavanaugh for years not as a federal judge, but instead as the coach of my daughter's middle-school basketball team," O'Brien wrote. "In that capacity, I can personally attest to his kindness, leadership, and helpfulness." In her article, O'Brien noted that Kavanaugh is the "carpool dad," driving students to and from practices, games, and activities. "In a city where professional obligations can often take priority over personal ones, Brett is a steady presence at his daughters' events, even if it means racing across town just to catch the last 15 minutes of a game." 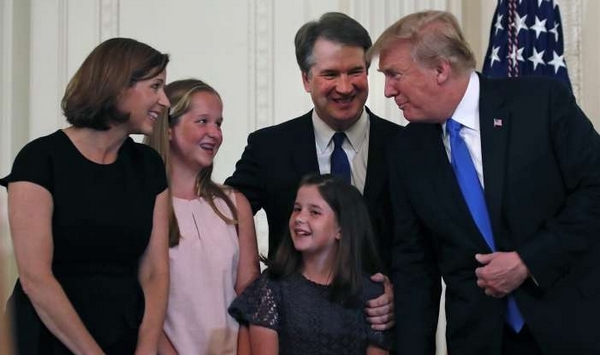 When O'Brien's husband died, Kavanaugh took her daughter to the father-daughter dance. No man is perfect, and the combination of youthful hormones and alcohol sometimes leads men to do things they regret. That said, if Kavanaugh did indeed abuse Christine Blasey Ford, that action seems very out of character. Once again, it has been decades since this alleged abuse took place. "This woman should not be ignored and should not be insulted," Trump spokeswoman Kellyanne Conway said on Monday. Conway insisted that Ford "should be heard." She should be heard, and so should the 200 other women who have testified about Kavanaugh's 35 years of respecting women, promoting their legal careers, and living above reproach. To be honest, I find the consistent testimony of 200 women — many of whom have known Kavanaugh for 35 years — far more convincing than one decades-old allegation that Feinstein hid for months, the FBI refused to investigate, and that Kavanaugh himself flatly denied. The same Democrats who asked the judge about Charlottesville, who pretended to be "Spartacus," and who interpreted a hand gesture as a white supremacist symbol have latched onto this allegation. Tags: 200 Women, Testify, Kavanaugh's History, Treating Women With Respect,' Going Back to High School, #METOO, 2018, Gender issues, sexual abuse, Supreme Court To share or post to your site, click on "Post Link". Please mention / link to the ARRA News Service and "Like" Facebook Page - Thanks!